If you’re looking for a cozy getaway this fall and winter, these charming Victorian inns are picture perfect! These beautiful Victorian homes have been made into inns and decorated in period style, including antique and vintage furnishings and fine antique-inspired furniture. The Hamilton-Turner Inn in Savannah, Georgia, was built in 1873 to be the home of Samuel Pugh Hamilton, known as “The Lord of Lafayette Square.” It was the first residence in Savannah with electricity. When the electric lights were turned on in 1883, those watching the house light up were afraid it would explode! The mansion was featured in “Midnight in the Garden of Good and Evil” as the location for many wild parties and the lavish decor really gives a sense of Savannah’s opulent style. The individually designed rooms and a separate carriage house feature details like antique four-poster beds, claw foot tubs, romantic fireplaces and ornate draperies. 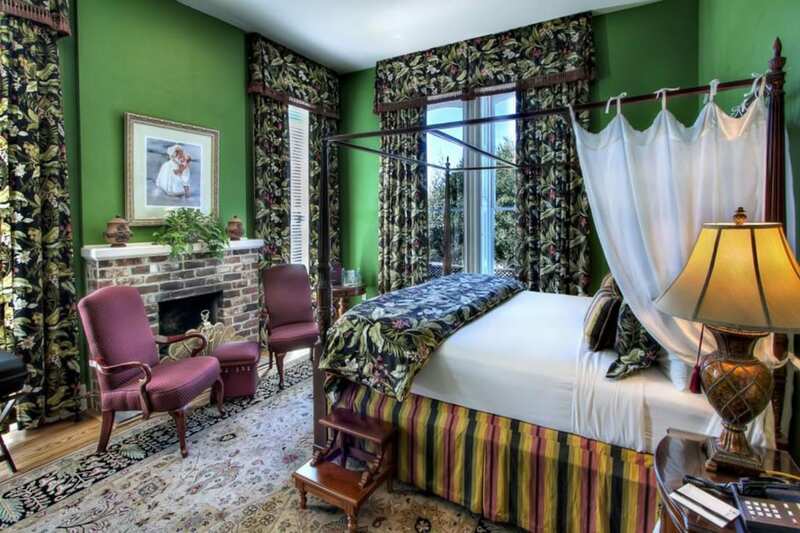 Chanticleer Guest House in Sturgeon Bay, Wisconsin, has a very different feel! This rustic retreat (above) in a renovated 19th-century farmhouse and barn is decorated with period antiques and surrounded by forest and ponds. The country charm makes this a lovely place for a relaxing weekend getaway curled up by the fireplace, but there is plenty of pampering too with whirlpool tubs and tasty breakfasts delivered to your room! The Jeweled Turret Inn (above) in Belfast, Maine, is a more traditional Victorian B&B, and a Landmark on The National Register of Historic Places. Built on Penobscot Bay in 1898, the Victorian house has been restored and decorated in classic Victorian style including some lovely antique furniture and collectibles. Outside, guests can relax on two verandas with porch swings. The “Tourmaline Room” shown above is decorated with antiques, lace, chintz, and a marble-topped bureau, and the bathroom features birds-eye maple woodwork and a Victorian claw-foot tub. The “Amethyst Turret” is a popular honeymoon room, located in an octagonal turret complete with a four-poster bed AND a fainting couch! It’s clearly designed for romance so the hero can sweep the heroine off her feet in several parts of the room! If you know a beautiful Victorian Inn that you’d love to recommend to our blog readers, please leave a comment or tell us on our Facebook page. And if you want more Victorian Inn inspiration, I hope that you’ll enjoy my earlier posts on Romantic Victorian Inns and Historic Inns. This entry was posted in Entertaining, News and tagged bed and breakfast, getaway, Historic hotel, Historic House, Historical Home Design, National Historic Landmark, romantic, travel, vacation, Victorian, Victorian Homes on October 20, 2016 by admin. We had a great time recently when we hit the Kentucky Bourbon Trail and visited the Mary Todd Lincoln home – it’s full of antique furniture! It all started when our nephew, Matthew, came and stayed with us for about 10 days this summer. He spent a good deal of time hanging out with Greg and learning to fix computers and cell phones. We drove him back to Columbus, Ohio, and then took a few days making our way home as a summer vacation. Greg is a huge baseball fan. 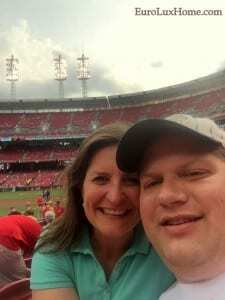 One of his bucket list items is to see a game in every national stadium, so of course, we stopped in Cincinnati at the Great American Ballpark to catch a Reds game. 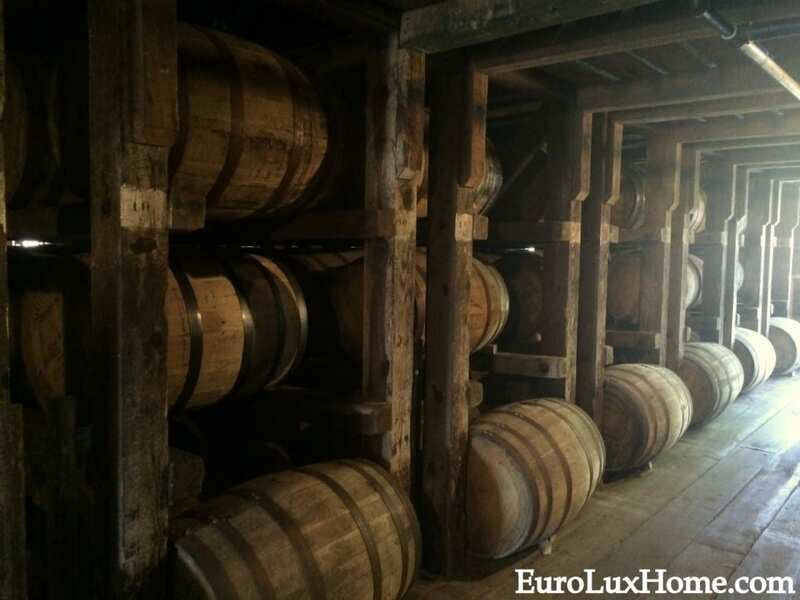 We drove on to Lexington, Kentucky, to hit the Kentucky Bourbon Trail! Greg and I love small batch bourbons and are on a quest to find our favorites. 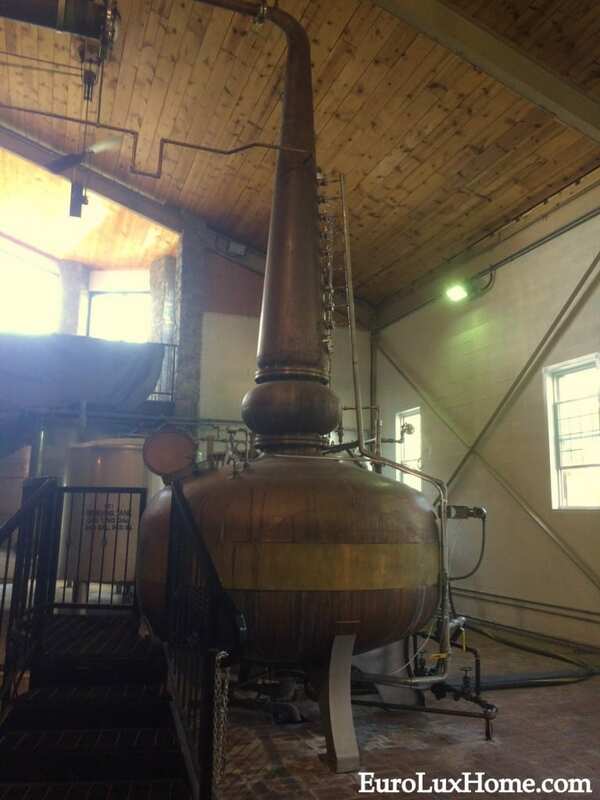 This is our second trip along the Kentucky Bourbon trail, as we visited the Maker’s Mark distillery several years ago. This time we stopped at Woodford Reserve, Wild Turkey, Buffalo Trace and Willet Distillery. It is very interesting to tour the production facilities and see how each business operates. Even better, we get to experience the tastings at the end of the tour! So far my absolute favorite is Basil Hayden, with Maker’s Mark a close second. Greg really likes Wild Turkey 101 and Maker’s Mark, but he says he still has many yet to try before he can call a winner. We also toured the Mary Todd Lincoln House. It was the first house museum site restored purely to honor a First Lady and it is filled with beautiful antique furniture. This is the dining room. I actually never knew that Mary Todd came from a very wealthy and politically connected family before she married Abraham Lincoln, so it was fascinating to see her childhood home. 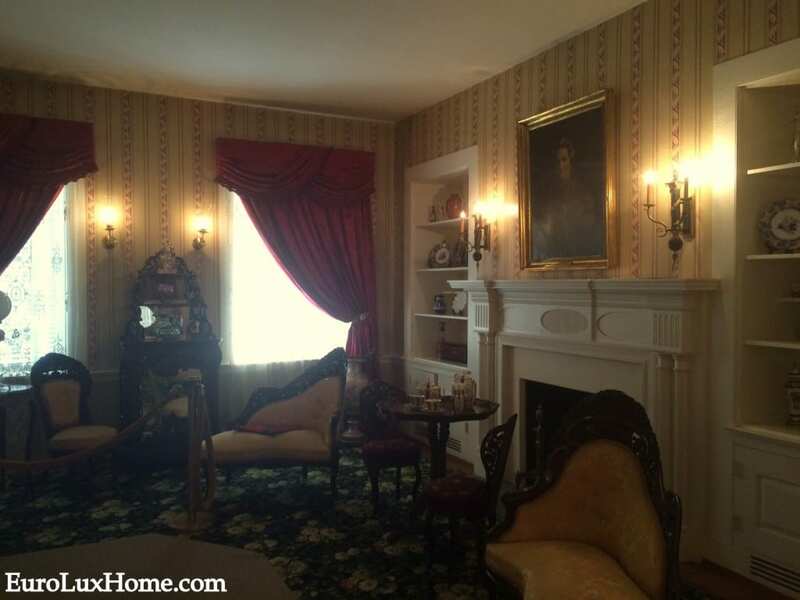 This is the Mary Todd Lincoln House parlor. The house was originally built in 1803 as an inn, before it became a private home in 1832. I always love a good historic home museum, and I can highly recommend this one if you’re in Lexington, Kentucky. I found it on Trip Advisor, my favorite travel mobile app. 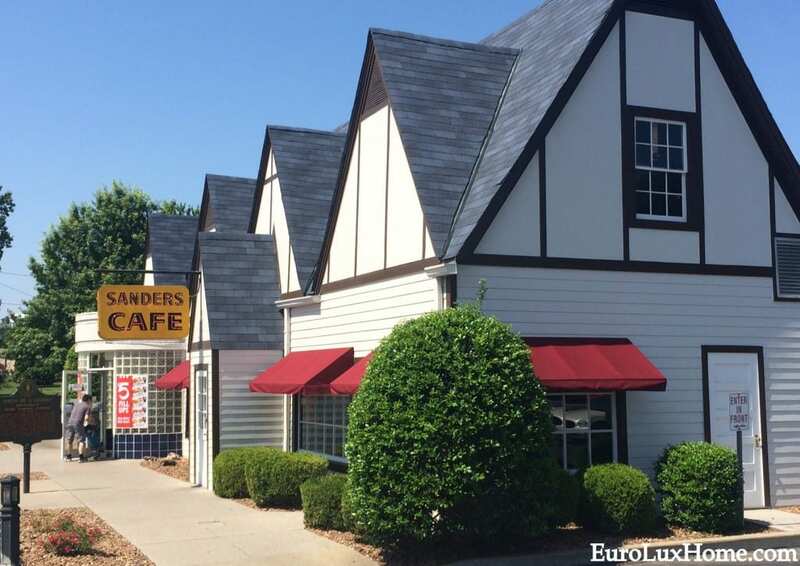 Finally, we stopped at the Sanders Cafe in Corbin, Kentucky, home to Colonel Sanders and Kentucky Fried Chicken! You can actually see the original kitchen where the Colonel worked out his original recipe, and of course you can eat lunch there. Entrepreneurship is near and dear to my heart, and Colonel Sanders is one of my business heroes, so I greatly enjoyed this stop. I admire that Colonel Sanders never gave up. He didn’t actually make his fortune until later in life, years after he sold his original cafe, hotel, and gas station in order to break even with his debts. It was a fascinating end to a short but sweet summer vacation! Where have you been traveling to this summer? Have you hit any historic sites? Tell us in the comments… we’d love to hear about it! This entry was posted in News and tagged Antique Furniture, Bourbon, getaway, Historic House, Historical Home Design, travel, vacation on August 23, 2016 by admin. These romantic Victorian Inns aren’t just for Valentine’s Day – you can enjoy them all year round. The Victorian era was one of the most romantic in terms of architecture and home decor, although I’m not sure I’d do so well without our modern-day amenities. Thankfully, visitors to these four Victorian inns get all the romance AND the Wi-Fi! The Oaks Victorian Inn on Main Street in Christiansburg, VA, has a very romantic story to tell. Major W.L. Pierce built the inn in the late 1800s for his bride, Julia. They lived happily ever after and had seven children. This is the Julia Pierce Room at the Inn, which was once Julia’s own bedroom. It’s been decorated with a Victorian bed and a hand-painted slate fireplace and the bedroom boasts a Jacuzzi tub big enough for you and your sweetie. Outside, you’ll find a garden with 300-year-old oak trees and a pretty porch. The Victorian Inn in the Victorian village of Ferndale, CA, makes a delightful base to explore California Redwood Forest. Built in 1890, the Inn boasts boasts vintage fixtures and furnishings in its rooms. This is the Victorian Parlor room with an antique armoire and a red velvet Victorian couch in the bay window sitting area. The VI Restaurant steps into the 21st Century with a mix of classic and contemporary Californian cuisine. That’s probably just as well, as Victorian food isn’t always a good fit for our taste buds today! 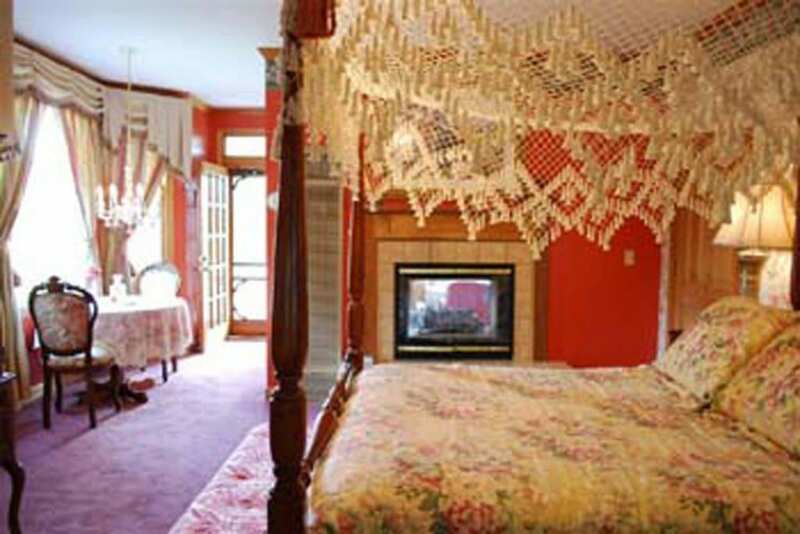 This charming bed in The Victoria Inn in Bethel, ME, looks so tempting. 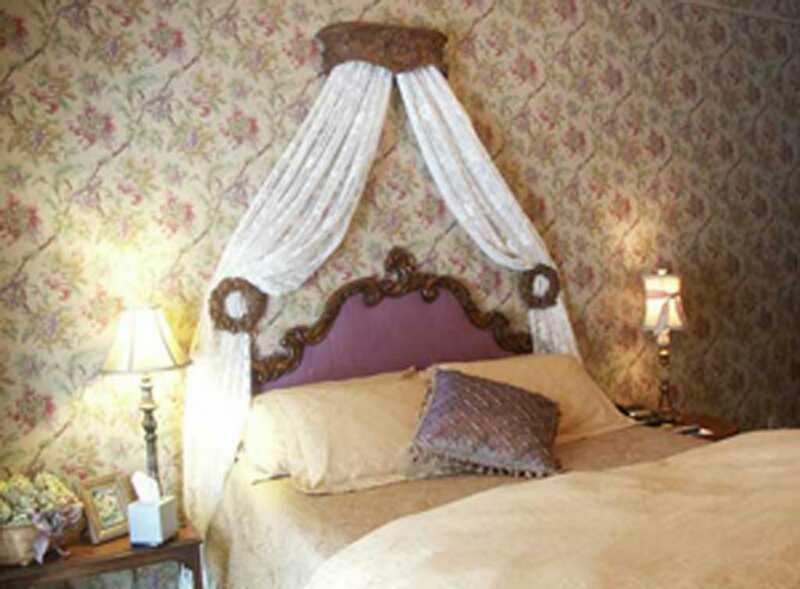 The romantic inn is a restored 19th century building filled with period Victorian decor and furnishings including lace-draped beds just like this one. Bethel became a vacation destination way back in the 1800s when city dwellers visited to enjoy the refreshing mountain air. 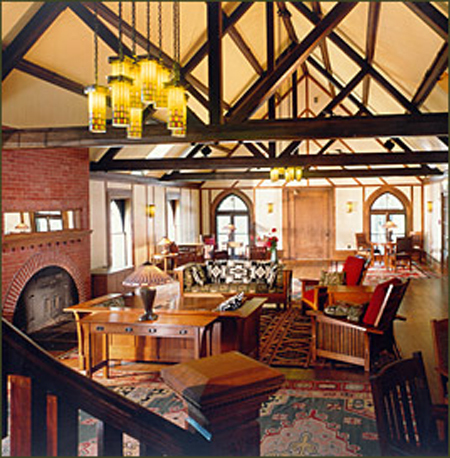 The allure is apparently timeless; Ski Magazine said that The Victoria Inn was one of the 10 best inns in New England. This is nearly in our backyard! The Innisfree Bed & Breakfast By-The-Lake is a AAA Four Diamond property overlooking Lake Glenville near Cashiers and Highlands, NC. 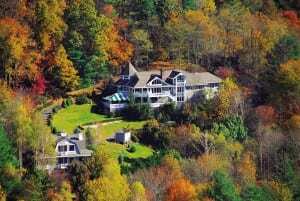 It is perfectly placed to explore the majestic Blue Ridge Mountains but I reckon it would be hard to tear yourself away from the house itself and the 12 acres of grounds filled with gardens and woods. Rooms at the Innisfree are named after Victorian personalities, including one named for the queen herself: Victoria’s Grand Suite with a mahogany four-poster bed. Then you’ll find the Lord Tennyson suite with a private veranda, chandeliers, a fireplace, and a tub for two overlooking the garden, and the Barrett Suite, shown above. This romantic boudoir boasts a canopied four-poster bed with French lace and a fireplace. During the day, guests relax in the sunny parlor, and by evening Irish coffee is served beside the cozy fireplace. Guests go for dinner in the inn’s octagonal Tower Dining Room lit by chandelier. We’d love to hear about your favorite romantic Victorian inns too. Meanwhile, don’t forget our Valentine’s discount for your special person or just as a gift for your home. This entry was posted in Entertaining, News and tagged bed and breakfast, getaway, Historic hotel, Historic House, Historical Home Design, National Historic Landmark, romantic, travel, vacation, Valentine's Day, Victorian, Victorian Homes on February 14, 2015 by admin. 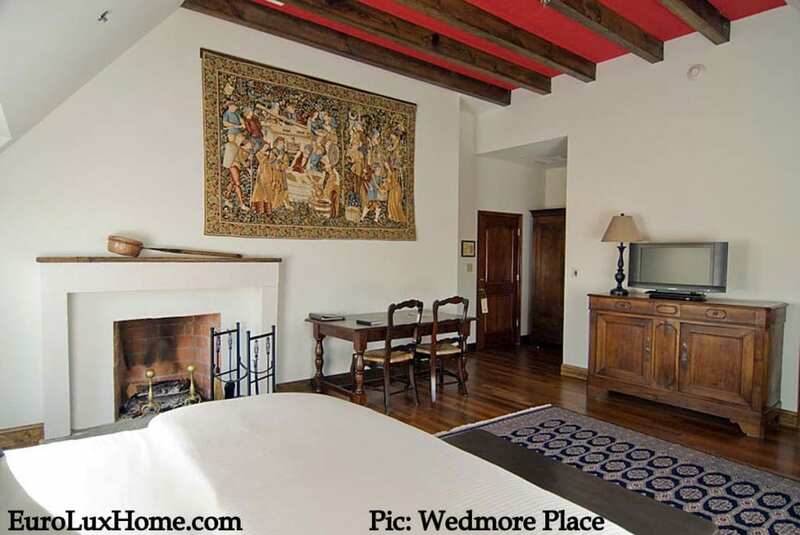 Wedmore Place is a country hotel at the Williamsburg Winery in Virginia. 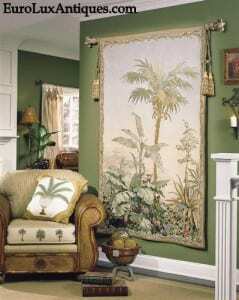 We noticed that some of the tapestries adorning their guest rooms are made by the same company as the tapestries we stock! Just to rewind a moment, we recently began selling some stunning new tapestries, inspired by formal European tapestries but made by a family-owned American company. The photo on the right gives you an idea of their incredible detail. They also make more casual linen artwork with a Parisian flea market vibe, as well as gorgeous pillows in classic and modern designs. Apparently the Wedmore Place Country Hotel shares our good taste in tapestries! Located on 300 acres overlooking the James River, in an area known as the Wessex Hundred, the property was once a farm and it was settled in 1615. By 1781, it appeared on military maps. The hotel features wall tapestries in some of its 28 rooms and suites, each room inspired by a different European province and era. The European country estate style hotel is decorated with period European antiques and furniture. Rooms also have wood-burning fireplaces, and fancy European bedding. 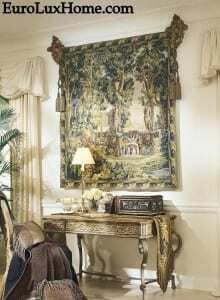 This new tapestry is the Brittany room, which also boasts an antique French armoire, dough chest, and dresser. 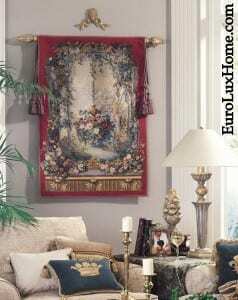 I can’t be sure, but I think the pillows on that fabulous carved four-poster bed might be made by the same company as the tapestries – they look similar in style to the ones we have on our EuroLuxHome.com site. The adjoining Williamsburg Winery was established much more recently, but it’s not surprising that the hotel chose this tapestry for their Burgundy room. It shows a grape harvest in the French wine-growing region of Burgundy. The room’s antique armoire and dresser date from the early 1800s and are from the Chateau de Sauvan. I love the old copper bed warmer over the fireplace. 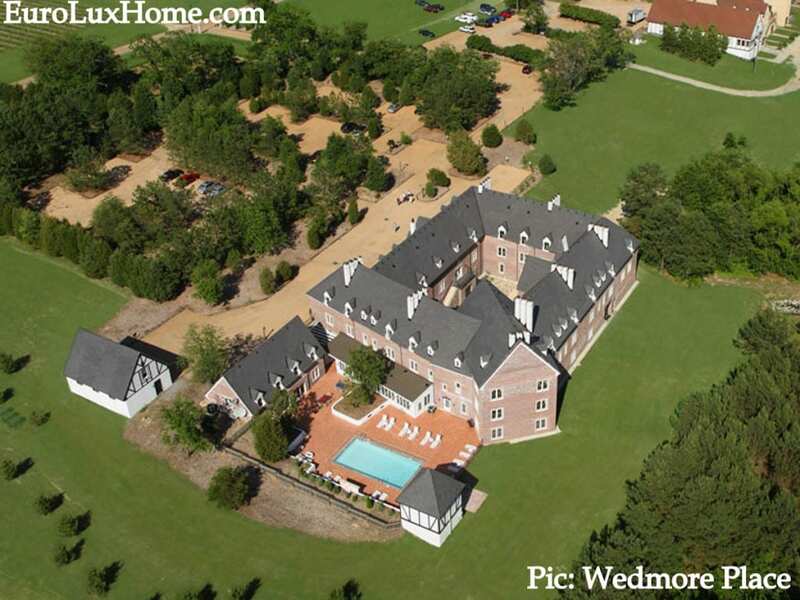 Wedmore Place at the Williamsburg Winery is located three miles from Historic Williamsburg, VA. It also offers spa services, a pool, and a 19th century British style library. Sound relaxing, much? This entry was posted in Antique Furniture, Entertaining, News and tagged bed and breakfast, French Antiques, getaway, Historic hotel, Historical Home Design, romantic, Tapestry, travel, vacation, wall art, wall decor, wall hanging, wine on October 20, 2014 by admin. 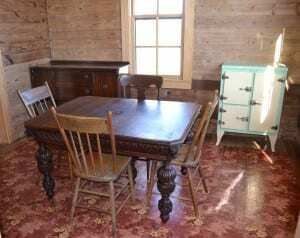 Ever since the new Johnny Cash Boyhood Home museum in Dyess, Arkansas, bought an antique table from us, it’s been great to follow the progress of the house restoration. My first blog post about the Johnny Cash Boyhood Home Museum described the history of the table and of the Dyess Colony. The Cash family moved there in 1935 as part of a New Deal experiment and they worked hard on the land to pay back their debt to the government. My second blog post about the opening of the Johnny Cash Boyhood Home includes a quick video tour around the inside of the restored house. You get a glimpse of our 1890 antique Mechelen table too! Johnny’s siblings Joanne Cash Yates and Tommy Cash remember having a table just like this in their childhood home. That blog post also explained how the family might have come to own such a valuable antique Mechelen table. Now the Johnny Cash Boyhood Home has opened, it is getting rave reviews! Johnny Cash was very interested in his family history going back even further than his childhood. The country music star researched his ancestry and traced it all the way back to Scotland. The man who wrote “King of the Hill” discovered that he was related to a real king: King Malcolm IV of Scotland. 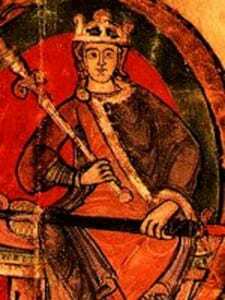 In the year 1160, Malcolm IV’s niece – who was named either Cash or Cashel – married the Earl of Fife. Johnny learned that many roads and farms in Fife still carried the Cash name, and he visited to see for himself. He even recorded a Christmas special show there in 1981. You can imagine how surprised the local Scottish people were to see legendary Johnny Cash wandering around their town along with singer Andy Williams! Fife also had a big linoleum industry, prompting the Scottish newspaper The Daily Record to make the joke that Cash’s hit song I Walk the Line should be renamed I Walk the Lino! You can find out how to visit the Johnny Cash Boyhood Home in Dyess, Arkansas at this link. Don’t forget to admire our antique table in the family dining room! This entry was posted in Client Spotlight and tagged antique dining table, Antique Renaissance furniture, dining room, Historic House, Historical Home Design, Johnny Cash Boyhood Home, Mechelen, Mechelen Style Antique Furniture, Scotland on September 17, 2014 by admin. Johnny Cash Home Opens – With Our Antique Table! Back in January I told you about the antique table that the new Johnny Cash Boyhood Home Museum in Dyess, Arkansas, bought from us. The good news is that the Johnny Cash Boyhood Home Museum will have its grand opening on August 16! My earlier post about the Mechelen oak table in the Johnny Cash Boyhood Home explained that the heavily-carved antique table is just like one that the Cash family owned. That’s why the Arkansas Heritage Sites Office bought it from EuroLux Antiques.com to go in the restored Johnny Cash house dining room. 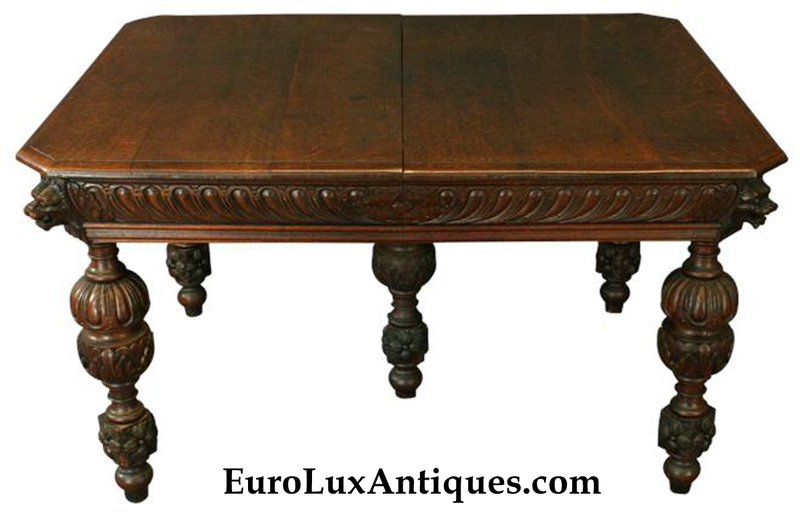 The antique table was crafted in Belgium in around 1890 in the Flemish Renaissance style. I asked Dr. Ruth Hawkins, director of Arkansas Heritage Sites at Arkansas State University, how the family came to own such an ornate and expensive table. I learned that the family remembers it was one of the few things that their mother brought with her to Dyess in 1935 and it was very old at that time. I recently saw a show called Ring of Fire at the Newberry Opera House, which tells the life of Johnny Cash through his songs. The show mentions that the ancestral Cash family had been wealthy Southern planters until the Civil War, when their home was destroyed by Union troops and the family was set adrift. It would make sense that the table came from this Southern plantation and was one of the remaining family heirlooms. I was also interested to learn that apparently Johnny Cash was interested in his family history. He really researched his ancestry and traced it all the way back to Scotland. I’ll tell you about that in a post on another day. The Grand Opening of the Boyhood Home of Johnny Cash will be on Saturday, August 16, 2014. That’s the day after the Johnny Cash Music Festival in Jonesboro, AR. Johnny Cash’s daughter Roseanne Cash will speak at the opening ceremony, and so will Joanne Cash Yates and Tommy Cash, the younger siblings of Johnny Cash and consultants for the museum. It’s free to go to the opening ceremony but if you want to take a tour of the Johnny Cash Boyhood Home too, tickets costs $10. Find all the information at this link and here is a schedule for the day. You can read more about the fascinating background to the house and the Historic Dyess Colony at my previous post on the Johnny Cash Boyhood Home Museum. If you like the striking design of the antique table, learn more about Mechelen style antique furniture. This entry was posted in Antique Furniture, Client Spotlight, News and tagged antique dining table, Antique Renaissance furniture, dining room, Historic House, Historical Home Design, Johnny Cash Boyhood Home, Mechelen, Mechelen Style Antique Furniture on July 30, 2014 by admin. 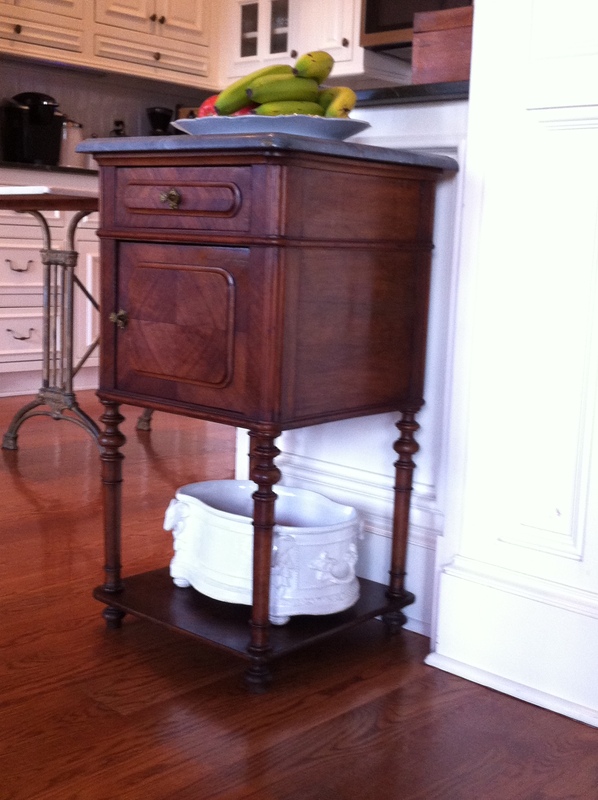 It’s always great to see how our clients blend antiques into their decor. This month we also took a little journey around some historic inns that boast antique decor. Let’s revisit our favorite interior design and antique decor blog posts from May. In our series of client spotlights, we showed how Kathleen in Oklahoma cleverly turned a French antique nightstand into a pretty kitchen table with storage! The walnut and marble nightstand in the Henry II style dates to 1900 and Kathleen has given it a whole new lease on life. That blog post also showed other creative ways to repurpose antiques, including a Tibetan altar and a 19th-century antique English secretary. I love to see antique decor used in unusual ways. You can bet these pieces are a terrific conversation starter when guests arrive! Our Art Nouveau chandelier client spotlight told how commercial pilot Gary found an antique chandelier in our gallery that rivaled one he saw in Rome, Italy! The Italian antiques dealer wouldn’t negotiate the very expensive price so Gary browsed the vintage and antique lighting on our website. He liked our wide selection, high quality, and reasonable prices. 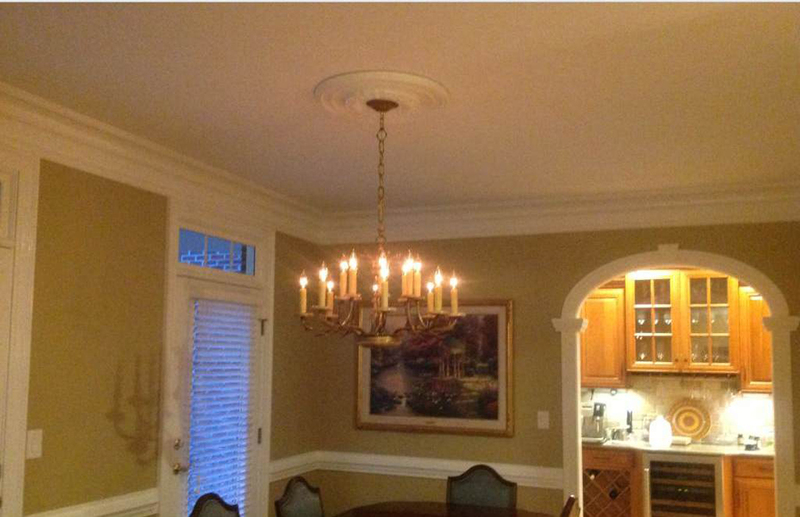 Gary lives in nearby North Carolina so he visited us to choose this Art Nouveau chandelier. Doesn’t it look stunning in his elegant dining room? 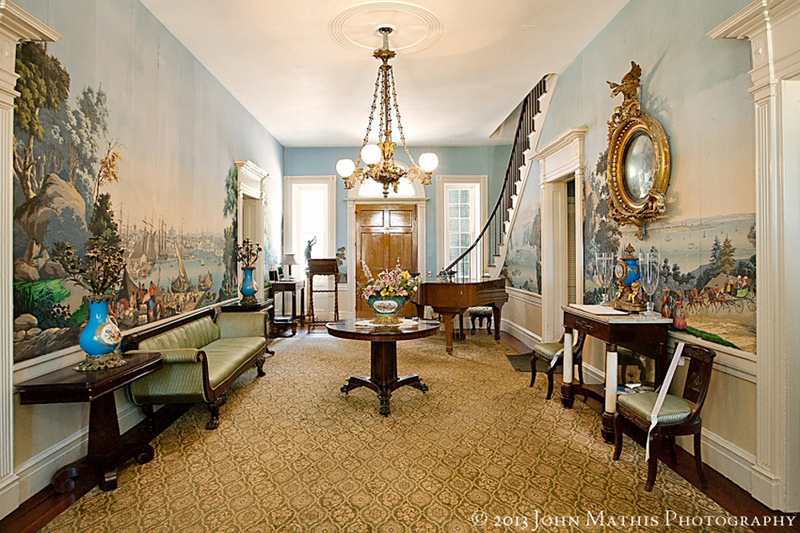 This gorgeous hallway is in the Monmouth Historic Inn in Natchez, MS. 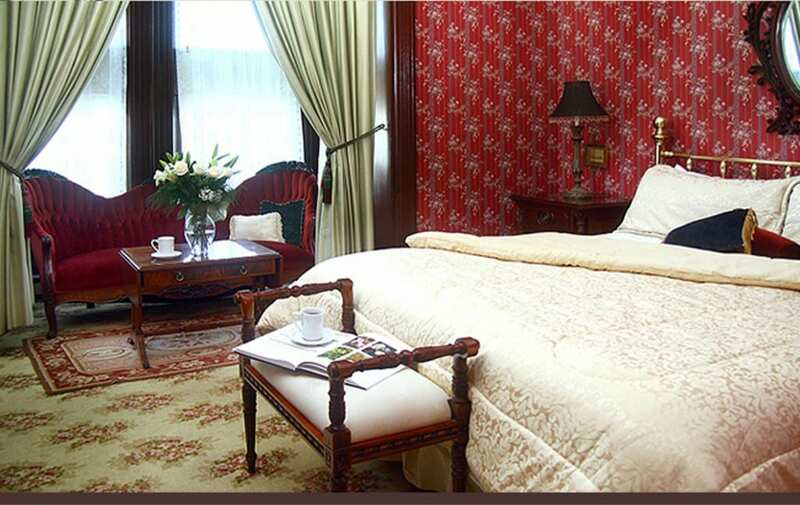 It was built in 1818 and the rooms are furnished with antebellum-era antiques. It’s just one of the places to visit in our post on beautiful historic inns around the country. The inns all boast delightful antique decor to add to the romance! In our series of posts on 2014 home decor trends, we took a look at trendy but timeless nailhead trim on furniture. These very rare antique French Hunting chairs in the gallery offer a fine example. The embossed leather panels are attached to the ornately carved oak chair frames by attractive nailheads that were crafted and placed in 1880! Fast forward to 2014 and even the high-quality reproduction furniture we carry looks neat with nailheads! 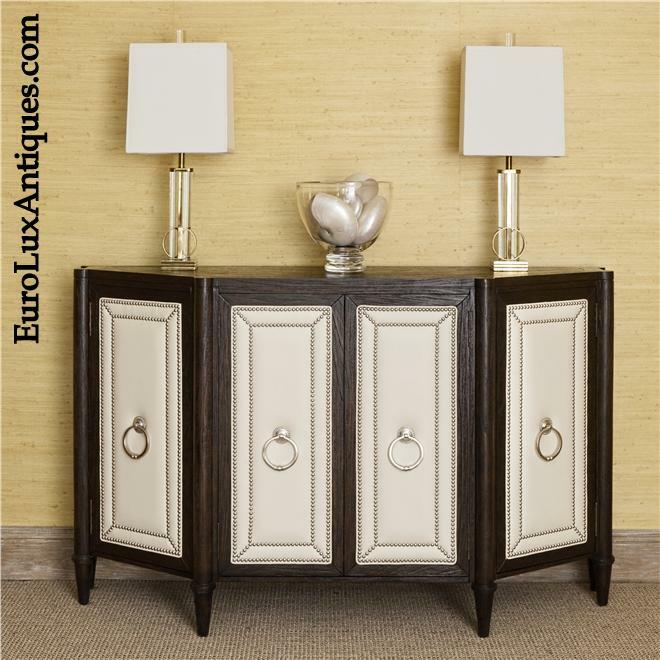 How about this impressive Ambella Home Manhattan collection sideboard? Thanks for sharing the month with me. I’ll be back with more antique decor and home design inspirations in June! This entry was posted in Antique Furniture, Home Design Ideas, News and tagged antique French furniture, antique furnishings, Antique Furniture, French Antiques, high quality reproduction furniture, Historical Home Design, home decor, how to blend antiques into decor, interior decor, interior design, travel, vacation on May 28, 2014 by admin. Visit a Beautiful Historic Inn this Spring! If you’re looking for a spring getaway, why not check into one of these historic inns? Some beautiful old houses around the country have been renovated to their former glory and turned into an inn. Many boast antique furniture and period decor too. 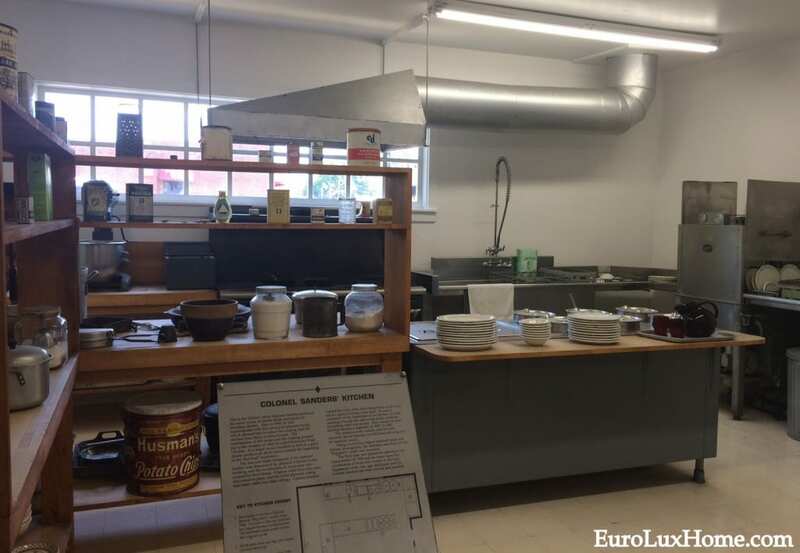 It’s a great way to step into history and enjoy the antiques lifestyle! 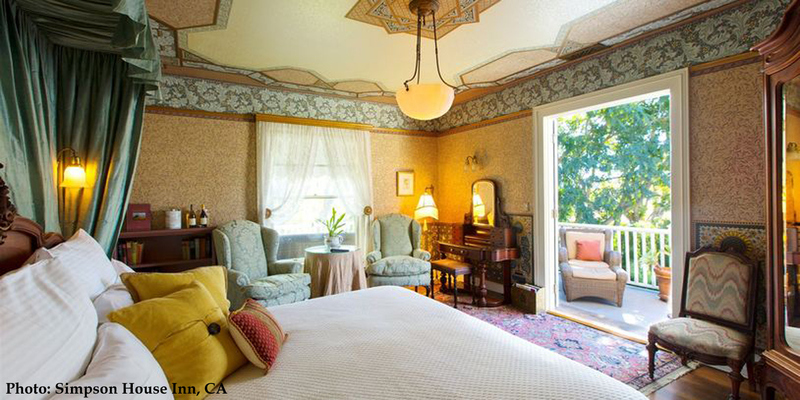 Simpson House Inn in gorgeous Santa Barbara, California, is an old Victorian estate in an acre of English gardens. The guest rooms in this luxurious historic inn are scattered between the 1874 Victorian home and restored barn and garden cottages. The Victorian decor includes antique clawfoot tubs and antique beds – so romantic! 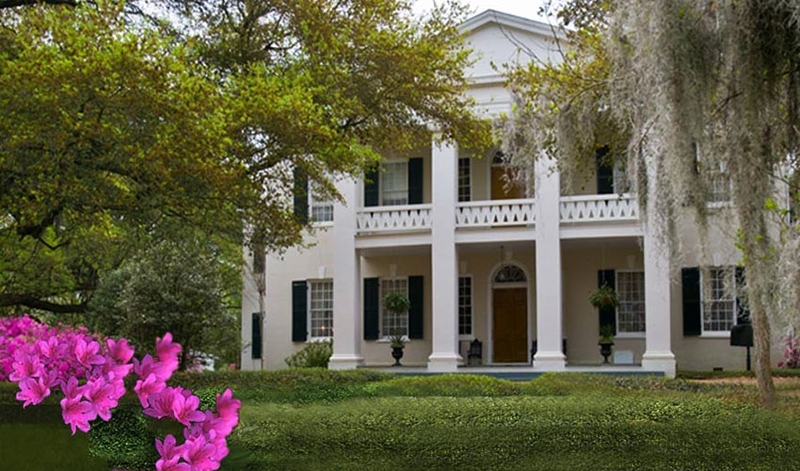 Tucked away in Natchez, Mississippi, you’ll find the Monmouth Historic Inn. Natchez is 90 miles southwest of Jackson, MS, and it’s actually the oldest city on the Mississippi River. The Monmouth Historic Inn was built in 1818 and the rooms boast period decor and antebellum-era antiques. You really are stepping back in time! This hall in the Monmouth Historic Inn shows the detail in the period decor and antique furniture. No wonder it’s a National Historic Landmark. If you can tear yourself away to explore outside the inn, you can wander around 26 landscaped acres. The Roycroft Inn in East Aurora, New York, is a wonderful place for anyone who loves Arts and Crafts decor. The National Historic Landmark opened as an inn in 1905, as a hub for artists in the American Arts and Crafts Movement. As you might expect, there is some lovely woodwork in the old inn. The library has an old stone fireplace and you can also see original Alexis Jean Fournier murals in the foyer. The Preservation Directory lists historic inns in every state if you’d like to find one closer to home. Or tell us about your own favorite historic inn in the comment box below! This entry was posted in Entertaining, News and tagged bed and breakfast, getaway, Historic hotel, Historic House, Historical Home Design, National Historic Landmark, romantic, travel, vacation, Victorian Homes on May 15, 2014 by admin. Biltmore House and Gardens Estate in Asheville, North Carolina, is a National Historic Landmark and a wonderful place to visit. I believe it is the largest privately owned house in the United States. The 250-room Biltmore House with its fine gardens set in 8,000 acres offers plenty to see for those of us who love historic homes. 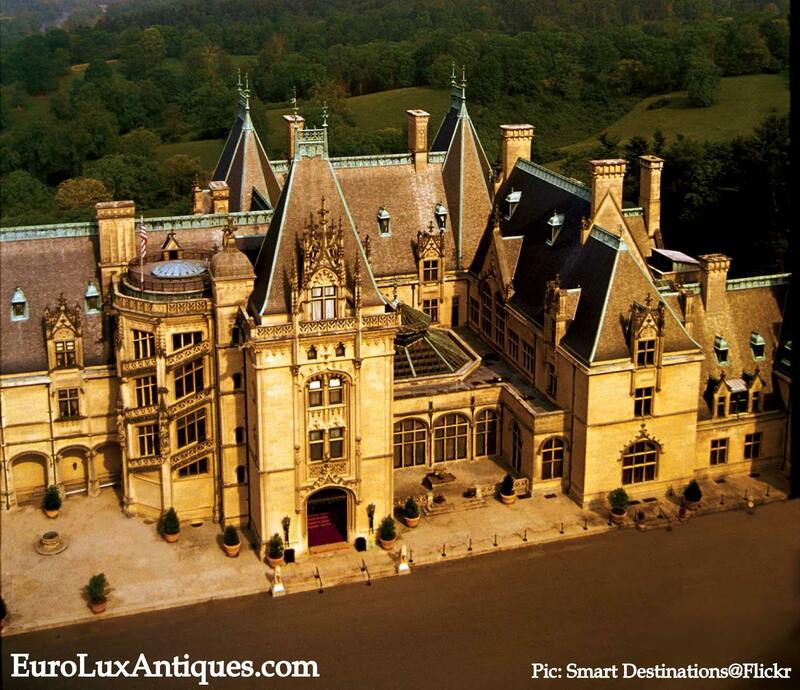 Biltmore House was built by George Vanderbilt after he visited Asheville in 1888 and decided it was a sweet spot for a country home. He called the estate Biltmore in honor of two Old Country words. ‘Bildt’ was the area in Holland that the Vanderbilts originally came from and ‘more’ is an Old English word that means rolling hills. The house opened with a family celebration on Christmas Eve of 1895. What a great Christmas gift! Vanderbilt was keen to model his new home on the working estates of Europe and he had the house designed in a château style, inspired by the architecture of French Renaissance châteaux in the Loire Valley. The architect was Richard Morris Hunt and as you can see he did a terrific job of copying the château look! 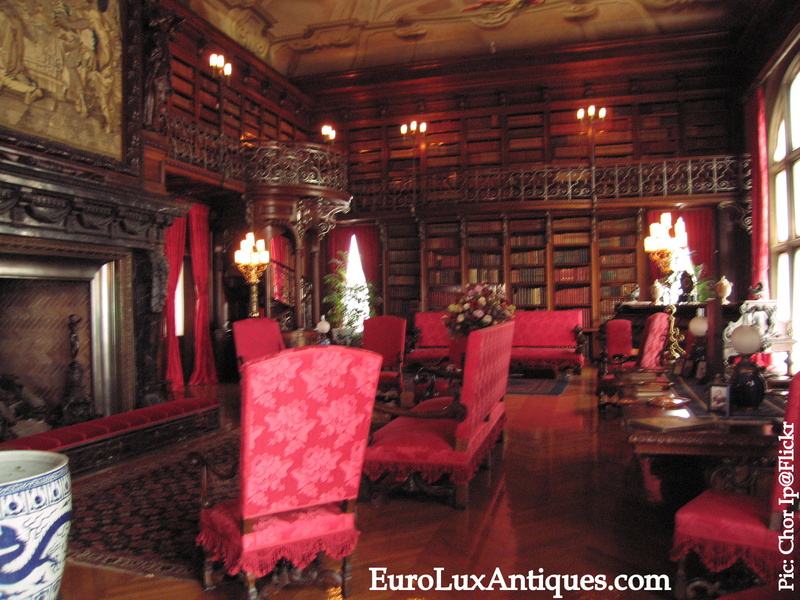 Inside the house, this library is richly decorated with red upholstery and drapes, wood floors and a giant fireplace. The warm mood of the library just invites you to curl up with a good book and there are 10,000 volumes to choose from! When President William McKinley visited Biltmore House in 1897, the New York Times reported that he was especially pleased to linger in the luxurious library. We can see why. 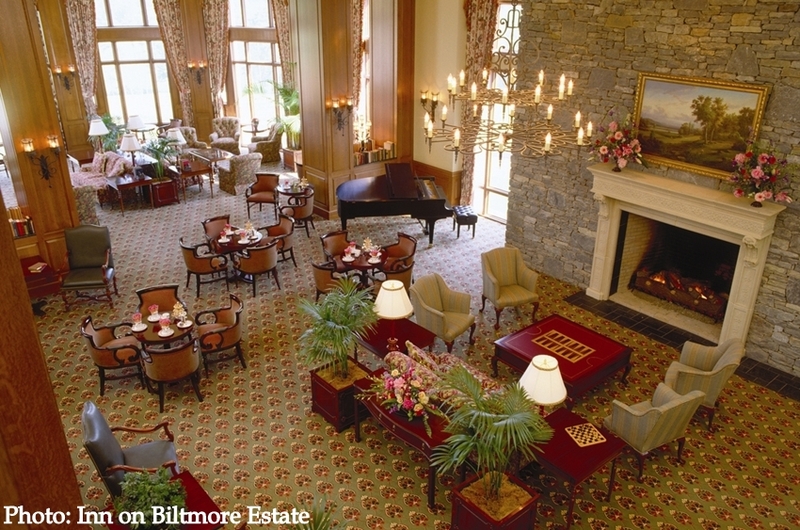 This impressive Biltmore House Banquet Hall also features red upholstery on the chairs. The glowing red adds a little warmth to the stone walls, otherwise the 70-foot-high hall could feel a little chilly! A magnificent stone fireplace and huge chandelier also help to balance out the scale of the room. The French Renaissance châteaux inspiration is very clear – right down to the stags’ heads on the walls. During a self-guided tour of Biltmore House, visitors see antique furniture and art including John Singer Sargent paintings commissioned by Vanderbilt. 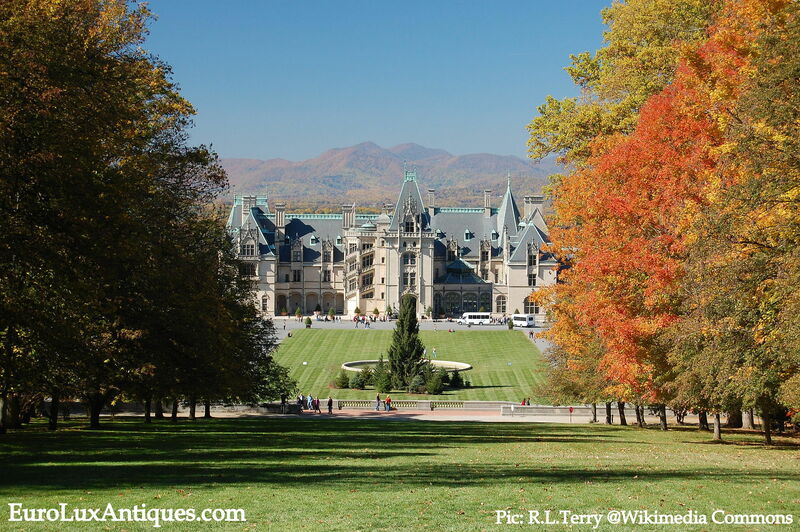 Biltmore House offers different charms in every season but the maple, elm and oak trees make it popular with tourists in fall. Leaf-peepers go to see the spectacular changing colors against the backdrop of the Blue Ridge Mountains. The Biltmore House landscape architect was Frederick Law Olmsted, who also designed New York’s Central Park. Many motion pictures have been filmed at the house and gardens, including Forrest Gump and Last of the Mohicans. Visitors can also stay over – although you don’t sleep in Biltmore House itself! Instead, you get a taste of the high life at the Inn on Biltmore Estate. It is literally the high life too – the boutique inn is located on a hill above Antler Hill Village and Winery, offering terrific views. After browsing the priceless treasures at Biltmore House, activities include carriage rides, horseback rides, a scout around the winery, and a float down the river. 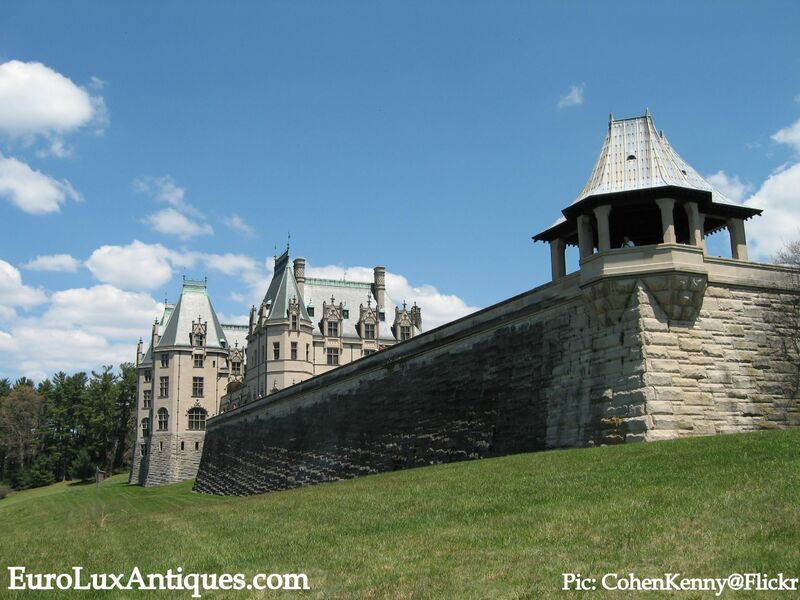 Have you been to Biltmore House and Gardens? Tell us about it in the comments box below. And if this inspires ideas for a very special trip, you can get more ideas in my previous posts about historic hotels, castles, and houses to visit. This entry was posted in News and tagged Antique Furniture, Asheville North Carolina, getaway, Historic hotel, Historic House, Historical Home Design, National Historic Landmark, travel, vacation on January 23, 2014 by admin. 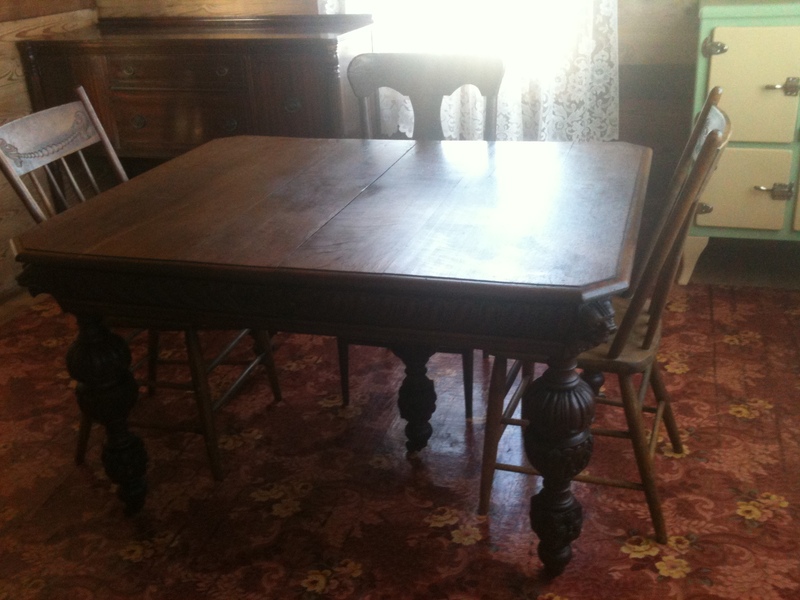 We were thrilled and honored when the Johnny Cash Boyhood Home Museum bought an antique table from us. The new Johnny Cash Boyhood Home opens in Dyess, Arkansas, this year, and this beautifully carved table will be in the Cash family dining room! 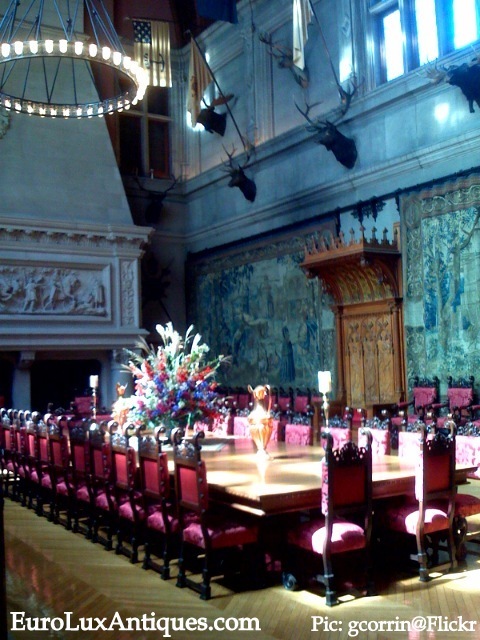 The Mechelen oak table is in the Flemish Renaissance style, dating to 1890. 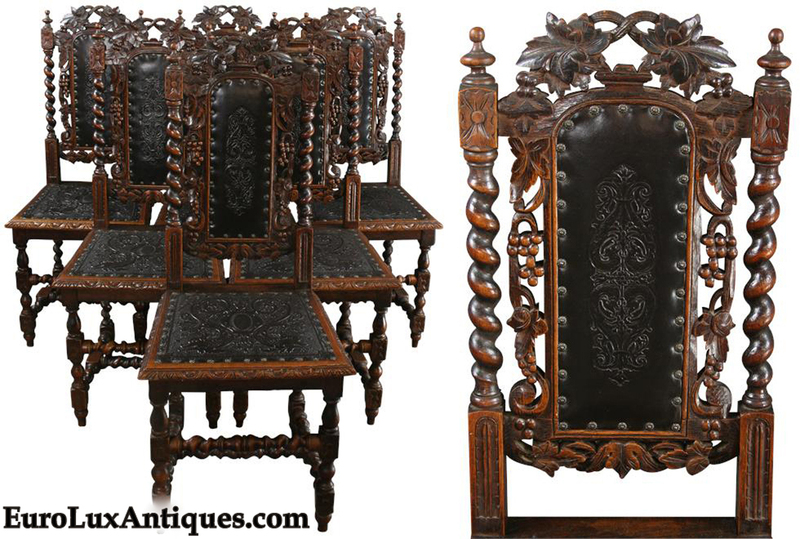 It was hand-crafted in Belgium with heavily-carved details typical of antique Mechelen furniture. Carved lion heads peer out from the four corners of the carved apron, and the table stands on five massive carved legs. We found the table at an antiques market in Belgium and brought it back to the U.S. We’re very glad we did because the table is just like one that the Cash family owned. Joanne Cash Yates and Tommy Cash, the younger siblings of Johnny Cash, are consultants for the new Johnny Cash Boyhood Home Museum. Both were born and raised in Dyess and they have good memories of the furnishings in their childhood home. They have described the rooms to the Arkansas Heritage Sites Office at Arkansas State University so that all the right furniture can be found. That’s how Dr. Ruth Hawkins of Arkansas State University came to contact us. She saw that we had an antique table fitting the description of the Cash family dining table, and we shipped it to her in November. 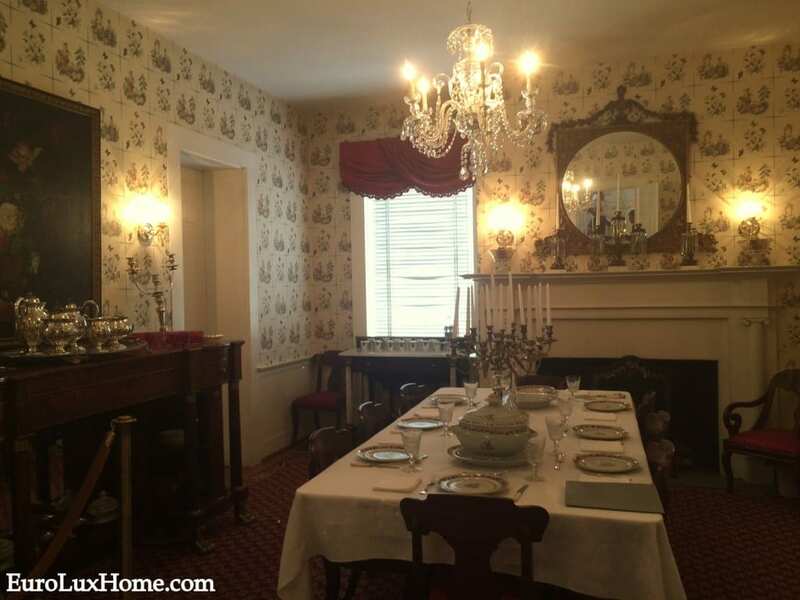 Here it is in the Johnny Cash Boyhood Home dining room in Dyess – Dr. Hawkins said it is perfect in the house! The Cash family moved here in 1935 when President Roosevelt’s administration created the Dyess Colony in a New Deal experiment. The government built 500 colony houses for out-of-work farmers to move in, clear the land, and convert it to agriculture with the aim of eventually paying the government back. The Cash family was given a five-room house and 20 acres of land… and they did indeed pay off their debt! Young Johnny Cash lived there from age 3 until he went into the Air Force in 1950. If you saw the motion picture “Walk the Line” you’ll have spotted the house in the movie. Arkansas State University now owns the house and they are busy restoring it. The last we heard, it is due to open in April 2014. I will tell you more background on the Cash family table and the museum itself when the Johnny Cash Boyhood Home opens. Meanwhile, you can track the progress of the house at the Johnny Cash Boyhood Home Facebook page. A fascinating list of household items already gathered and others still needed is on the Johnny Cash Household Registry site. They are looking for items ranging from 1930’s mops and brooms to a flour barrel with a wooden cover. Who knows? Maybe you’ll have one of those pieces to help the Johnny Cash Boyhood Home out. Then your name will be on a donors’ plaque at the historic house! You can also see more about the distinctive Mechelen style antique furniture in my earlier blog post. This entry was posted in Antique Furniture, Client Spotlight and tagged antique dining table, Antique Renaissance furniture, dining room, Historic House, Historical Home Design, Johnny Cash Boyhood Home, Mechelen, Mechelen Style Antique Furniture on January 16, 2014 by admin.